Are major championships better when there’s a classic duel between two superb players like Phil Mickelson and Henrik Stenson or when there’s a catastrophe, like the one exhibited by Jean Van de Velde almost twenty years ago? This year’s version of the Open Championship delivered a bit of both. While we missed out on the drama of anyone roaming around inside the Barry Burn, we witnessed collapses and duels all played out in the Sunday final. As we all know by now, Francesco Molinari played bogey-free golf on Sunday, making putt after putt to save par. He was never the story however until he couldn’t be ignored any longer. Despite two wins and two runner-up finishes in both Europe and America over the past couple of months, Molinari was still playing in the shadow of Jordan Spieth, one of three co-leaders on Sunday morning; and Justin Rose and Rory McIlroy, who lurked a few strokes back; and most of all, Tiger Woods, his playing partner, whose comeback was way ahead of expectations, to the point where he was getting TV coverage like he did ten years ago. Molinari reminds me of one of those Super Mario characters that just keeps on going regardless of the obstacles thrown in his way. Determined, implacable, relentless are all good words to describe the Italian. It would be very frustrating to play a match against him. He rarely makes a mistake. He rarely shows much emotion. He just keeps making putts and wearing down his opponents. When he sunk his birdie putt on 18 to all but secure the Claret Jug, Molinari gave it an emphatic fist pump, not in the style of Rory McIlroy’s fist-pump-pirouette-second-fist-pump after making eagle on 14 – more like a punctuation mark on a good round. Tiger tried and for a moment on Sunday he held the solo lead in a major for the first time since 2011. There shouldn’t be any doubt that Tiger can win again. His back appears to be completely healed and he hits the ball as far as ever. Perhaps the only thing missing is confidence. 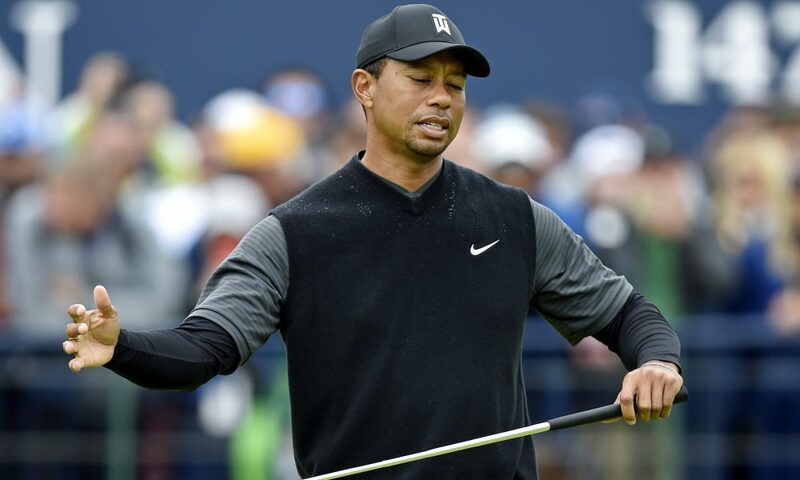 It seems strange to say Tiger Woods lacks confidence but on both 11 and 12 on Sunday, Tiger appeared indecisive and subsequently played shots without his usual aggressiveness. That lead to a double bogey and bogey and the end of Tiger’s hopes for a fourth Claret Jug. Until that moment however, both Woods and Molinari were bogey free and engaged in a classic duel while the leaders moved in the wrong direction. Spieth clearly didn’t have his best stuff and missed several short putts, his Achilles Heel this year. Kevin Kisner, who isn’t a stranger to major leaderboards recently, got off to a rough start and never recovered. 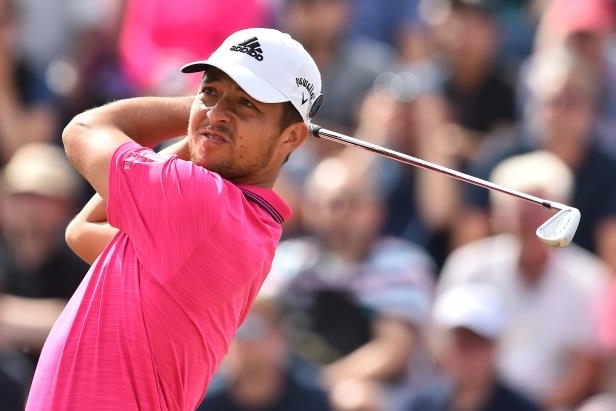 Xander Schauffele looked to be the steadiest of the three co-leaders but even he couldn’t sustain the lead under major championship pressure. Starting with a three-shot lead, it was theirs to win. But Carnoustie always seems to take its toll. Not exactly major collapses like in years past but definitely collapses in a major. The 27-year old Englishman, who plays on the European Tour, started the final round eight shots back of the co-leaders. To hear him tell it, he didn’t believe for a minute that he had any chance to win. Perhaps he forgot that 1999 winner Paul Lawrie had come from ten shots back to eventually beat leader Jean Van de Velde and Justin Leonard in a playoff or that 2007 winner Padraig Harrington had made up six shots on Sergio Garcia to claim the Claret Jug. Carnoustie is notorious for Sunday collapses and huge come-from-behind rallies. Maybe he saw names like Jordan Spieth, Rory McIlroy, Justin Rose, Tiger Woods and Tommy Fleetwood ahead of him on the leaderboard when he looked at it on Saturday night and realized that winning was a crazy idea. Plus, he had just shot 71 in the third round when everyone else had gone low on a day when the golf course was playing soft. So, on Saturday evening he overindulged. And on Sunday he felt the effects. 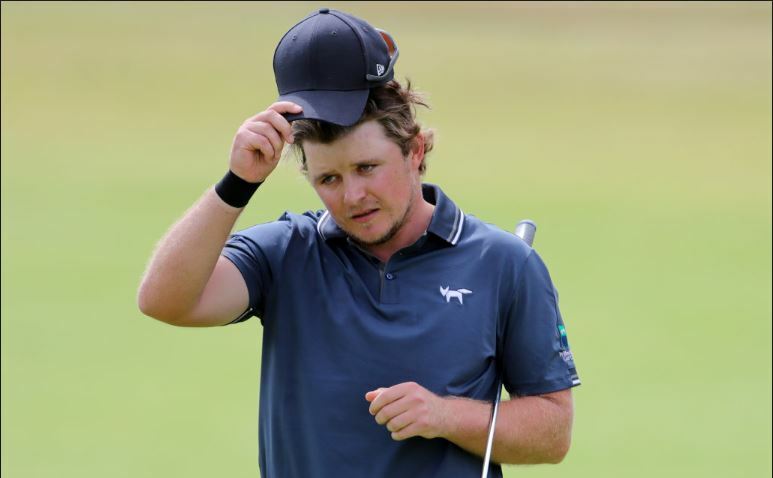 With leaders Spieth, Kisner and Schauffele backing up and the rest of the all-stars treading water, Pepperell’s 67 put him at -5 and the leader in the clubhouse. For about two hours, he had to wait, stay loose and prepare for a playoff. Stranger things have happened at Carnoustie. However, this year it was not to be. Justin Rose eventually posted a -6 to let Eddie Pepperell off the hook. But it could have been a great story. Much has been made over the past few years about the high school graduating class of 2011. It includes the likes of Jordan Spieth, Justin Thomas, Daniel Berger, Patrick Rodgers, Emiliano Grillo and Ollie Schniederjans. They burst onto the PGA Tour five years ago and have racked up victories, majors and millions of dollars. Xander Schauffele was also a member of the Class of 2011 but took a little longer to reach the PGA Tour. While his classmates were stealing the limelight from established stars on Tour and collecting hardware, Schauffele spent four years in college, then another on the Web.com Tour. He didn’t really get noticed until last year at Erin Hills, where he became only one of ten players ever to get to -10 in the U.S. Open. He didn’t win the Championship but not long afterwards he tasted victory for the first time at the Greenbrier Classic, then later the same year when he won the Tour Championship, resulting in PGA Tour Rookie of the Year honours too. Despite the success, Schauffele was still largely overlooked by the oddsmakers when it came to the Open Championship. He was shown at 80/1 and never got a mention on TV until he vaulted onto the third-round leaderboard. In fact, this guy flies so much under the radar that on Saturday he wasn’t even the most famous Xander in the field. Or is it Zander? That distinction went to Zander Lombard, a 23-year old South African, who eagled the 18th hole. When you think back on all the difficulty that Carnoustie’s 18th has posed over the years, an eagle is about the last thing you would expect. But Lombard made the shot and for a while had the broadcast crew confused about the Xanders. Or is it Zander? Schauffele played steady golf on Sunday but a few wayward shots cost him dearly. His 74 left him tied for second and his best finish in a major. Perhaps most importantly, he garnered a lot of attention and respect. So much so that NBC analyst Johnny Miller predicted he should be a favourite heading into the PGA Championship next month at Bellerive. And probably not looking to take a backseat to any of his classmates from 2011 any longer. Every time I hear people debating which is the better championship, it reminds me of an old Seinfeld episode where Izzy Mandelbaum (played by the late Lloyd Bridges) challenged Jerry to a weightlifting contest because Jerry had given a shirt to his father that said “#1 Dad”. Izzy’s son had given him a shirt that read “World’s Greatest Dad” and so the absolutely pointless debate raged about which was better, being #1 or being World’s Greatest. When it comes to the two Opens, history has favoured the new kid on the block, largely because Americans didn’t travel to the UK for many years and it’s thought that the Open Championship suffered from weak fields for a time. That’s no longer the case but the American bias persists. Both championships have delivered plenty of thrilling finishes over the years, but the edge must go to the UK version lately: the Stenson-Mickelson duel in 2016, the Spieth-Kuchar drama last year. This year both events witnessed collapses by the leaders - Dustin Johnson at Shinnecock and a trio at Carnoustie - and the subsequent battles were exceptional. For my money though, I’ll take the Open Championship every time. Apart from the diverse international field it collects and the brilliant sea-side courses, the R&A just runs a better tournament than the USGA. They let them play the golf course as they find it. They set it up and get out of the way. That’s certainly not the USGA way and the last three U.S. Opens have generated controversy because of it. The Americans have some weird predilection with par and try to force an outcome that isn’t always consistent with course conditions or weather conditions. The Brits accept that the weather will play a part as we saw at Carnoustie. The course played quite differently all four days. Nothing went amiss. No player complaints were voiced; no controversies ensued. Maybe the USGA will eventually learn to stay out of the way. In the meantime, the Open Championship crowned Francesco Molinari as the “Champion Golfer of the Year”. Isn’t that better than World’s Greatest or #1?